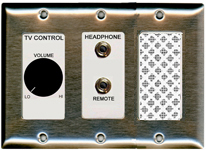 For the remote control of hospital grade television receivers, this one gang device includes a stainless steel 1 gang trim plate. This device is wired to the television's wired remote outlet facility and provides an easy means for staff and visitors to control a wall mounted TV. The volume control is a linear taper type with a 1.00" knurled knob. The Channel Change control is a RED button with a Form "A" Normally Open momentary switch. Using the same control frame as above, this device provides an easy means for staff and visitors to control a wall mounted TV. The controls are mounted on a Decorator style frame with laser printed lettering with a wear guard coating. The knurled volume control is a linear taper with a 1.00" knob. The Channel Change control is a RED button with a Form "A" Normally Open momentary switch. This model features the same control set as the standard DTR2220ST, yet includes a headphone jack for local/private listening use. You can order the smaller 3.5mm (pod) jack(s) as desired. 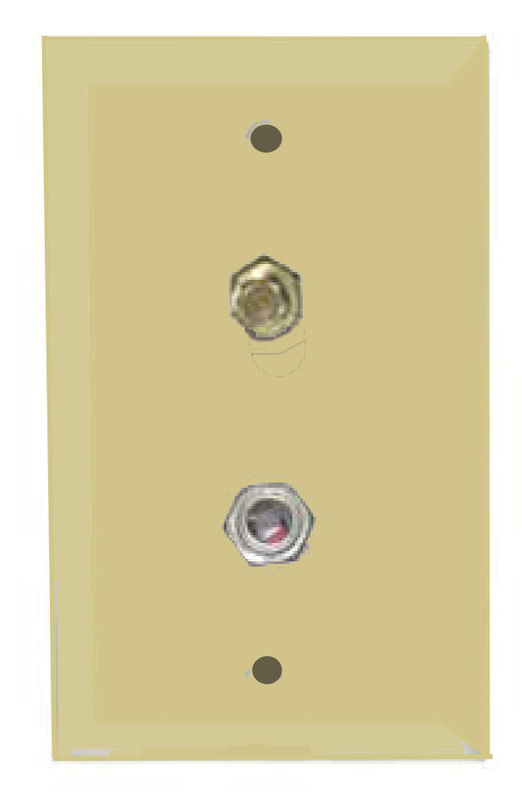 Packaged with a 2 gang stainless steel trim-plate, connectors, screws, and features pre-stripped color-coded leads. Requires a standard 3 gang, 2" deep back-box. For the remote control of hospital grade television receivers. This model has a headphone jack and a button for the remote channel change function. This model is ideal for dialysis units and other locations where patients may wish to hear their TV privately and can change programming without leaving their station by use of a standard button cord. 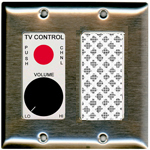 For the remote control of hospital grade television receivers, this one gang device includes a stainless steel 1 gang trim plate. This device is wired to the television's wired remote outlet facility and provides an easy means for staff and visitors to control only the Channel Change of a wall mounted TV. The Channel Change control is a RED button with a Form "A" Normally Open momentary switch. For the remote control of hospital grade television receivers, this one gang device includes a white PVC 1 gang trim plate. This device is wired to the television's wired remote outlet facility and provides an easy means for staff and visitors to control only the Channel Change of a wall mounted TV.